Almost one in 10 voters has supported a far-right, anti-immigration Pegida candidate in mayoral elections in the East German city of Dresden. Pegida’s Tatjana Festerling came fourth in the city’s polls, surpassing most polling forecasts. With 9.6 percent, Festerling, 51, came behind left-leaning frontrunner Eva-Maria Stange, the joint candidate for the Social Democrats, Greens and left-wing Linke, who was first in Sunday's first round, taking 36 percent of the vote. Stange was followed by a candidate from the right-wing Free Democrats party (FDP), who won a little over 31 percent. The candidate from Chancellor Angela Merkel’s conservative CDU party came third, with 15.4 percent of the vote. Since no single candidate managed to win an absolute majority, the election will go to a run-off on July 5. Pegida has, at its peak, attracted up to 25,000 people onto the streets of Dresden in an anti-immigration rally. But according to pre-election polls, published by the Technical University of Dresden, Pegida (an acronym for Patriotic Europeans Against the Islamization of the West) was expected to win just 1-2 percent of the votes. Festerling's supporters on Facebook said it was "a good, respectable election result." In recent months the far-right movement, viewed as racist by its opponents, cut down its activities as Pegida leaders were busy with internal strife. Since October, the group had held weekly rallies for five months, with its rallies often challenged by counter-protests that in some German cities reportedly outnumbered the group's supporters. Pegida calls for an introduction of a new immigration law that would boost immigrants' integration and ban Islamists fighting alongside ISIS in Syria and Iraq from returning to Germany. While its manifesto opposes extremism and calls for Germany’s Judeo-Christian religious culture to be protected, the group has been looking to raise the alarm over the rise of the influence of Islam on European countries. Pegida’s anti-immigration rhetoric and growing support have come as a public embarrassment for Angela Merkel's government. Germany's determination to throw off its Nazi past has made governments hypersensitive to tackling racism and xenophobia. Bachmann was reinstated as Pegida leader a month after resigning, however. Days before the election in Dresden, up to 2,000 people attended a campaign rally for Festerling, according to police. 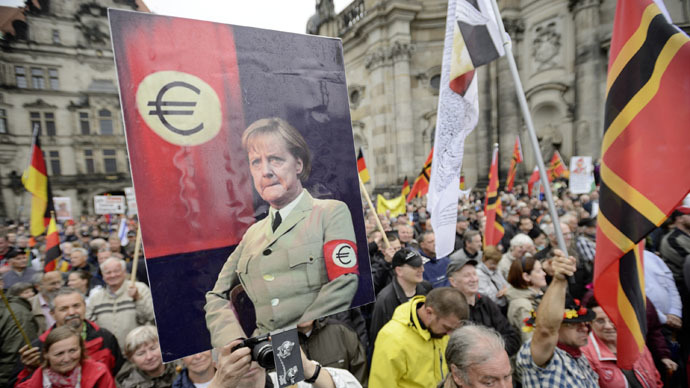 The crowd of Pegida supporters held a range of placards, some featuring Chancellor Angela Merkel dressed as “Fatima” in a headscarf, others mocking at President Joachim Gauck as “Uncle Asylum” showing him dressed in a turban, according to AFP. Saxony is among the states with the smallest immigrant population, estimated at less than 3 percent. More than 430,000 registered voters were eligible to vote in Dresden after the conservative mayor had resigned, citing health reasons. This time around turnout reached 51.1 percent, according to the Elections Office, significantly higher than in 2008, when 42.2 percent voted.